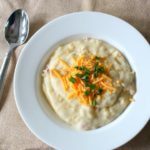 Do you love baked potato soup as much as I do? It’s one of my favorite recipes in the winter. 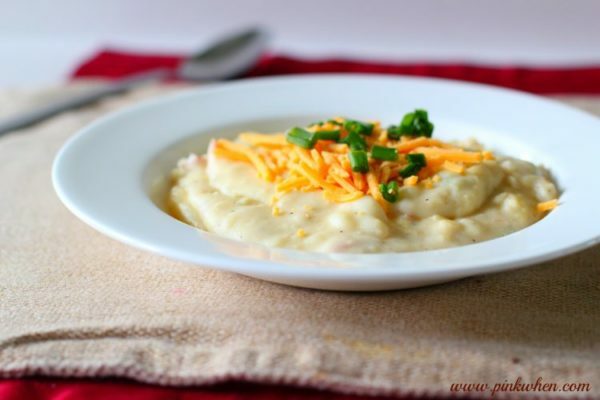 I love sharing my favorite cold-weather recipes, and this Baked Potato Soup Recipe is the best. It’s a scrumptious and filling recipe that will be perfect for the whole family. If you like potatoes, bacon, and cheese, you are going to be in heaven! Not only is this baked potato soup delicious, but it’s relatively fast for a potato soup. Let’s get started! But it’s DELICIOUS! And it’s relatively fast for a soup recipe. Only 40 minutes! 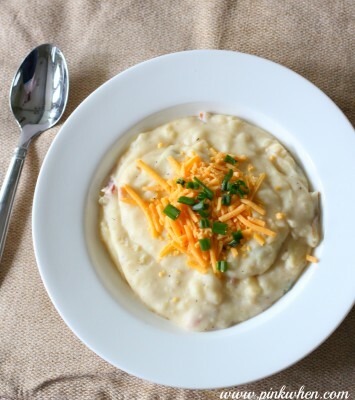 You need to have a few ingredients on hand to make this baked potato soup. Step 1: If you haven’t cooked your potatoes yet, go ahead and peel the potatoes, cube them, and cover them with water. Boil the water for 20 minutes, or until potatoes are soft. Step 2: Take the bacon slices and cook in a skillet over medium heat. Drain, crumble and set aside. Step 3: In a large saucepan, melt your butter over medium-high heat and whisk in the flour until smooth. Slowly pour in a little milk at a time and continue to stir. Slowly add the milk to allow it to thicken slightly. Step 4: Add in the potatoes and the chopped green onion and stir. Increase heat slightly until your mixture comes to a boil. Lower heat and allow the soup to simmer, and stirring frequently. While simmering, go ahead and chop your bacon slices. Step 5: Add in the bacon slices, sour cream, salt, pepper, and cheese until mixed well and the cheese is melted. 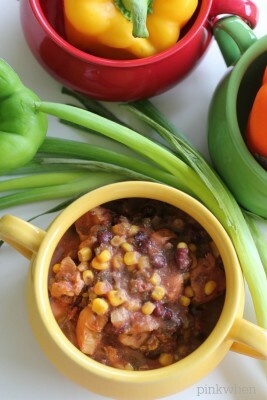 Serve warm and with toppings of sour cream, bacon, green onion, and cheese if desired. One of my favorite recipes. It’s so warm and filling, and is scrumptious! My husband LOVES to cook, so he likes to help me in the kitchen when making this, and we love to cook together. Get your spouse, significant other, kiddos, or friends to help out and make this fun, family recipe. 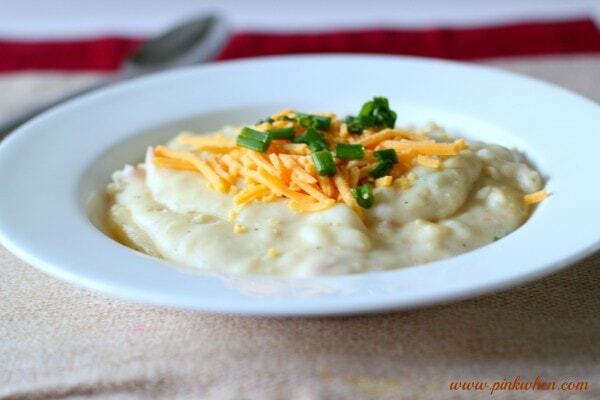 Do you have a different Baked Potato Soup Recipe you like? You might also like this Red Lentil Soup recipe. Or this Chicken Tortilla Soup. A delicious and easy baked potato soup recipe made with milk, butter, potatoes, and bacon. Peel, cube, and cook potatoes if you haven't done so already. Boil them in water for 20 minutes or until the potatoes are soft. Cook the bacon in a skillet over medium heat. Crumble and set aside. Melt the butter in a saucepan over medium-high heat and whisk in the flour until smooth. Pour milk in small amounts, gradually stirring. Continue to stir and add milk until all of the milk has been added. Add the potatoes and chopped green onions and stir. Increase the heat until the soup mixture comes to a boil. Then lower the heat and allow the soup to simmer. Stir frequently. Add in bacon slices, sour cream, salt, pepper, and cheese. Mix well until the cheese is melted. Serve warm with toppings or your choice. I sent this recipe to my husband this afternoon with a little note that said, “Hint hint.” Sadly, a snowstorm hit our town today and he couldn’t stop at the grocery store on the way home because the roads were too dangerous. You still have time to make it….I won’t take it off the blog 🙂 You will love it, it’s delicious! We love soup in the wintertime. This looks delicious! Pinning! I made a great soup last night and of course I was flying by the seat of my pants and wrote nothing down. But I can duplicate it. I think it’s a blog post! You should totally make yourself that recipe and share it on the blog. I love to do that! 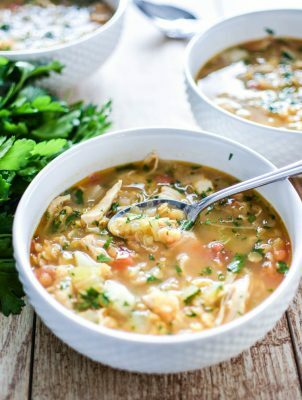 I’m trying to do soups for the whole month of January and this one is totally going on my list to try! !